recruitment test. There are total 50 Diploma Trainee vacancies available in this KBUNL Recruitment 2018. Apply online through KBUNL official website @http://jvdtcareers.net on or before 16-05-2018. This KBUNL Diploma Trainee Jobs Recruitment is based written exam and skill test. 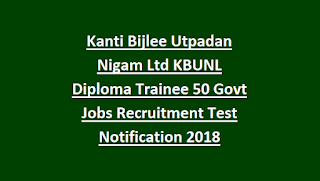 Kanti Bijlee Utpadan Nigam Limited KBUNL Diploma Trainee Electrical, Mechanical, Civil Engineering Jobs 2018 selection process, age limits, qualifications and other details are mentioned below. 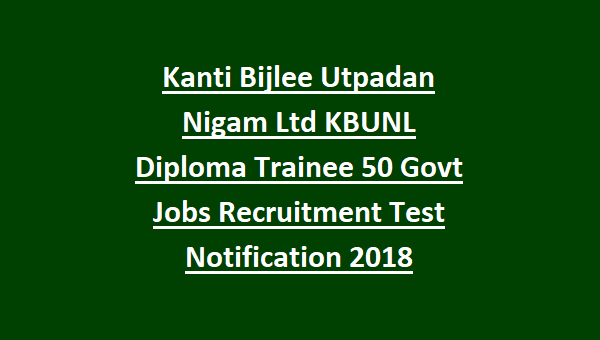 Notification of KBUNL Diploma Trainee Jobs Recruitment 2018. Post Name: Diploma Trainees-50 Posts. Monthly salary of Rs. 15500/- to Rs. 34500/-. Candidates must have qualified polytechnic diploma in Civil Engineer, Mechanical Engineering, Electrical Engineering and C & I. Upper age limit for general candidates 25 years and for Land outsters upper age limit is 35 years. Age limits are applicable for reserved candidates. Written test and Skill tests will be conducted for candidates selection of Diploma Trainee recruitment of KBUNL. Written test will consists of two parts. Part I (Knowledge/Subjective Test): Consists of 70 Mcqs. Part II (Aptitude Test): Consists of 50 Mcqs. Written test will be conducted on 14/15-06-2018. Candidates who qualified written exam they are called for skill test based on merit in written exam. Skill test is for testing the candidates working skills. Skill tests are same like practical's in diploma. Application fee for General/ OBC category candidates is Rs.300/-. No fee for SC/ ST/PWD/ XSM candidates. Apply online through KBUNL official website of http://jvdtcareers.net for this Diploma Trainee Jobs. Last date for applying online is 16-05-2018. Exam pattern, admit card, exam result and other details are will be updated in jvdtcareers.net website only. Apply online for the KBUNL Diploma Trainee Jobs Recruitment 2018. Please share this KBUNL Diploma Trainee Jobs Recruitment Examination 2018 article to your friends.